X-Aviation is proud to announce our fourth offering that lets you Take Command! The X-Aviation Take Command! brand of products represents the very best of flight simulation immersion, and assures you this Hot Start product is one of the most sophisticated, study sim level aircraft available for X-Plane! Real world pilots test and assist in the development of these products, and real world procedures are followed. 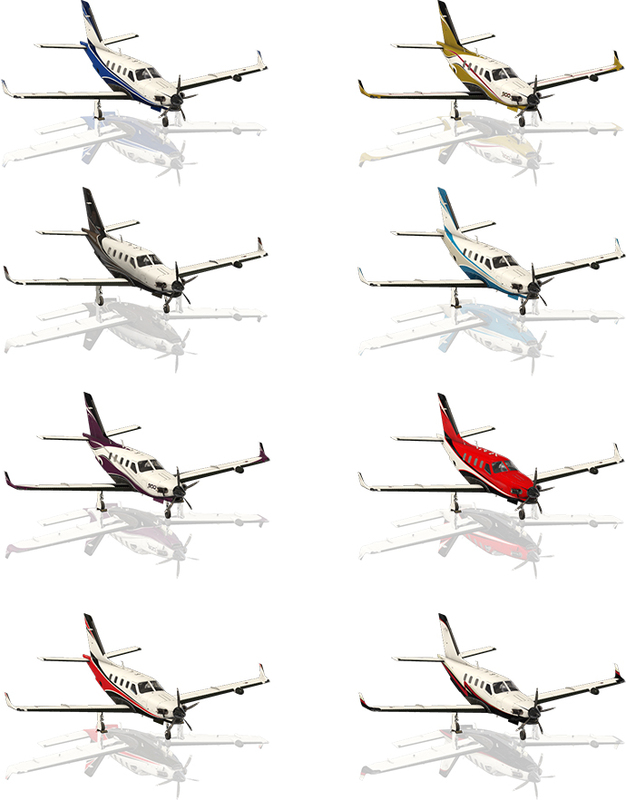 It tells you these products are unlike any other product you've seen outside of the ever growing X-Aviation catalog! Want to feel like a real captain? Take Command! Quick Facts: Quick start interactive tutorial in sim, custom failure engine, fully simulated icing and rain effects (both on windows and airframe), custom 3D sound engine with real sounds recorded from a TBM 900, G1000 simulation with Synthetic Vision, maintenance simulation to see how much wear and tear the aircraft accumulates, extremely detailed interior and exterior (down to even each LED light modeled in the strobes). This aircraft is simply in a class of its own for features and immersion! Comaptibility: Mac, Windows & Linux. X-Plane 11 only. Hot Start is a team comprised of two very talented, well known developers in the X-Plane world. While the name may be new, their previous projects (BetterPushback and the Take Command! : Saab 340A) are far from new and have been met with tons of awards and accolades over the years. Combining forces has allowed these two developers to create the ultimate TBM 900 simulation like none other seen for any flight simulator to date. The main objective for Hot Start was to create a product that not only simulated beautiful artwork and intense systems simulations, but also to be a learning platform for its pilots. You will become intimate with the knowledge of the PT-6 engine, the costs of maintenance for over-time wear & tear, and how flying specific ways may harm or help the aircrafts longevity. The first time you install and load the aircraft you'll immediately understand why this simulation is so different and special. You'll be greeted with a voice and visual overview live in the cockpit of how to start the engine. It's very in-depth, and allows you to get a good feel for what's going on almost immediately; and it's fun! The avionics include a custom simulated G1000 complete with Synthetic Vision. It's not just "there", it actually requires you to properly use the avionics at your disposal or risk harming the aircraft! Everything specific to a TBM 900 is there, and from a systems perspective the small but important nuances are there to a degree never seen before! From the ground up, the avionics simulation has been focused on heavy use of modern multi-threaded CPUs and fluidity. Each custom subsystem, such as the weather radar, TAWS and engine indication systems, to name but a few, is coded to run in its own set of threads and interact with the rest of the avionics in an asynchronous manner. This has allowed us to assemble the aircraft without the usual balancing act of trading graphical fidelity for simulator frame rate. The attention paid to the physical simulation of systems is second to none. For example, the aforementioned weather radar isn't just a pretty display that scans across a pre-existing weather map. It really does simulate radio beam propagation, energy absorption, scattering and reflectivity. What comes out on the display represents the output of a complex ballet of physical calculations. When you turn up the radar gain, the radar really does alter the way it samples its input beam returns. Huge efforts have been put into the flight and engine model of this aircraft, which was one of the first things that we started working on over a year ago. The results are both impressive and amazing, and this was thanks to one of our beta team members who owns a TBM 900 and our developer was able to get real flight time in the aircraft. Beyond this, we also made the aircraft available to other owners and pilots of the aircraft to get their feedback and get the hand flying experience just right. From the start, we have been focusing on making the aircraft "feel" like a real machine. And if you have dealt with real aircraft, you will know that they can be moody at times. Sometimes the engine starts on the first try, sometimes it just seems to want to drag its feet. Other times, you come up to the aircraft and the battery is strangely low, so you need to sit on the ramp after engine start a bit longer to let it charge up. While working on the core systems model in the TBM900, we have taken a great deal of time to focus on getting this kind "personality" coded into the aircraft. • Full aircraft state persistence. Every switch, flight control position, fuel state and on-airport position is restored upon reload. Even between reloads, system resources change in real time. The engine and oil cools down slowly between flights, the battery drains, tires slowly deflate, etc. • Fine-grained systems model, down to individual sub-components. The always-on failure system realistically responds to wear & tear and overstress for each sub-component based on individual load factors. Over-torque, over-temp, frequent starts, hard landings, operating in FOD-contaminated environments and many more all affect individual sub-component wear & tear and service life. • Sub-component wear realistically reflects on aircraft performance. Worn engine parts reduce maximum available power, worn prop reduces top speed, worn tires result in worse grip during ground ops, etc. • Aircraft maintenance manager to inspect and repair or replace any damaged sub-component. The maintenance manager tracks per-airframe operating expenses in a realistic manner to show the real cost of operating the aircraft. • Airframe manager that allows you to operate multiple simulated airframes, each with their own independently tracked wear & tear, livery selections and custom registration marks applied. • X-Plane 11 G1000 avionics stack with lots of customizations and overlays to simulate the special extensions in the real TBM900. This includes a custom EICAS, systems synoptic pages and special integration with the extra simulated systems such as the weather radar, TAS, electrics, etc. • Integrated Synthetic Vision into the PFD with obstacle display, navigation pathways, airport labels and TAWS-B integration. • Integrated live charts display from FAA and Autorouter.aero. Navigraph integration will be available in a future update. • Fully custom electrical system. Simulation of all buses, switching behaviors and reconfigurations. Full circuit breaker system, integrated with the X-Plane failure system, so a failed or failing system can pop a breaker. • Highly accurate PT6 engine model with realistic startup and operating behavior. Engine lag, secondary fuel flow, ITT evolution, response to auxiliary load and many more fine-grained behaviors. • Custom prop governor, with all modes simulated, including electric auto-feather with negative torque sensing. • Crew Alerting System integrated into the avionics stack with all annunciations, takeoff/landing inhibits, flight state filters and "corner cases" simulated. • Environmental Control System integrated into the custom EICAS. Air conditioning and pressurization respond in real time to environmental factors such as ambient temperature, pressure, available engine bleed air, cabin temperature setting, cabin pressure vessel failures, etc. • Custom TAWS-B ground proximity warning system with all annunciations modes, inhibits, real-time impact point prediction and terrain painting up on the MFD to ranges of 200NM. The TAWS-B uses the X-Plane terrain DSF data to construct its database, so it is always "up to date". ﻿ • GWX 70 weather radar with weather & ground modes and realistic radar return painting. Full simulation of radar beam energy dissipation, signal attenuation when passing through dense weather and vertical cell analysis modes. Terrain mapping accurately paints surface features, including recognizable peaks, valleys and lakes. Supports the X-Plane 11 default atmospheric model as well as xEnviro. • GTS 820 Traffic Advisory System (TAS) with aural alerts + visual alerts, the TAS MFD page and compatibility with X-Plane default traffic, PilotEdge, Vatsim and IVAO. • Dynamic custom registration mark painting on the fuselage and instrument panel with support for custom TrueType fonts, colors and positioning. This lets livery painters make a "generic" livery and each pilot apply their own custom registration mark with just the click of a button directly in the simulator. Liveries can specify a custom position and font to optimize the look. • Includes quick start and user interface guides. By Far the Best GA Plane out there, Highly Recommend. If you're lookin for a high quality aircraft, you found it. Also, thought I had an issue with it cra.. Highly recommended. This has to be the gold standard in X-Plane payware. The attention to detail is ..
A great aircraft with such amazing detail. Well worth the price! I´ve just got the Hot Start as I am very keen of these single engin turbos. I´ve several planes by X.. The most incredible GA plane for XP11 to date, hands down. I own many other gems, but this is the cr.. The best aircraft for X-plane, a "must have" payware aircraft in my opinion, 100 of 5 stars!! I recently purchased my copy of the Hot Start TBM900 and from day 1 I have been extremely impressed .. This team has set the bars high. Precise flight model with such in depth systems and THE BEST custom.. I was not very excited about this plane when it first released then I decided to pick it up. Instant..
Hi have only taken the one plane up once and was very impressed. Can we tint the windows? This is now the only aircraft I fly in the sim! Holy wow! Amazing airplane!.. Best ga plane out there ! loving the voice tutorial the cost system realy gives you a sense of ownin..
Parabéns ao "Time de Desenvolvedores X-Aviation" por criar essa ferramenta de estudo e simulação de .. This is the best aircraft i have flown in X Plane 11 by far, a must have payware aircraft in my opin.. I became a real world pilot after flying Microsoft Flight Sim a few times in 1994. Sense than both r.. When you get into this plane, you will continue to be astonished by every little detail. This plane .. This plane is just everything I have been looking for in flight simulation. It is complex and accura.. Simply the best GA aircraft in the sim, same level as ff a320, it worth every cent, only thing that .. I have literally spent hundreds of dollars on planes in x-plane and to be quite frank.... I have bee.. This is the next step in flight sims you feel that you are in a real TBM 900.thank you and keep it u.. Simply the best thing to happen to flight simulation ever. The attention to detail and realism is simply amazing. This is a must have if you are into a true si.. This is an unbelievably good modeling of the TBM. Seriously... everyone else that has done it - My n..
IN-CRE-DI-BLE !! Fantastic bird to fly with max realism. By far my favorite with the IXEG B737. Our entire hobby has leveled up because of this one aircraft. Finally. Many try, but very very few succeed in making an absolutely superior product. Take Command .. Absolutely amazing. And now (post 1.05) even lighter on frames than several other renowned GA aircra..
i'm impressed! one of the best plane ive ever flown in xplane. If I could only fly one aircraft in XPlane this would be my choice, the most realistic airplane in X..
Great work, the best aircraft for flight simulator. This is easily the best aircraft I have added to my long collection in Xplane 11! Super deep complex.. The best addon for x-plane. Close with FF A320. Very nice work Toto & co. This is the plane that I have been waiting for. I can highly recommend this aircraft if you are look.. The benchmark for all payware. This is an industry changer because now, Xplane users will no longer ..
A new benchmark for X-Plane and flightsim in general! Absolutely impressive, what you guys have done I hope many others follow in your footsteps, they won.. Awesome! Top Simulation and worth the money. Simulates the real aircraft very well, and I know that ..
First impression when the TBM 900 is loaded is that this is a super high-quality simulation and... "..